CEU head coach Edgar Macaraya remind the Scorpions about their defensive schemes during the half time break. The Centro Escolar University Scorpions sat quietly facing their head coach Edgar Macaraya. They dropped 26 points on the Emilio Aguinaldo College Generals in the second period overhauling a five-point deficit after the first 10 minutes of play. Now they had a 38-29 lead. Macaraya sat on a monoblock chair whiteboard in hand and addressed his players. “Our defense,” offered Rodrigue Ebondo. The former San Sebastian Stags star pointed to one of his keywords written on the larger whiteboard behind him. The word “rebound” was written in big bold letters. His Scorpions have followed that to the letter outrebounding the Generals 26-19 in the first half. They had grabbed an amazing 14 offensive rebounds with seven coming from Ebondo. When Macaraya starred in the NCAA with the Stags, they won a couple of championships with him playing the shooting guard position. While he is known for his amateur record for the most triples made in one game with 14, a little known facet of his game was his defense. He took pride in shutting opposing two-guards down. And that has formed the core of his coaching philosophy – that playing defense is key and wins championships. The CEU coach then drew some diagrams on the whiteboard outlining how EAC has been finding Cedric Noube Happi on the blocks even as their long-range snipers Jan Jamon and John Tayongtong were misfiring. Ebondo nodded towards point guard Mon Abundo who was seated a few away from his left. Abundo is one of those type of point guards who despite his small size is built like a brick house. Strong, quick, blessed with good court vision, and a willingness to take the big shot. He and Ebondo have formed a good partnership. The Congolese center, spry on his feet and adept with the outside shot or the drive, pointed out that they have to take advantage of EAC’s poor defense on the pick and roll. Abundo agreed. “Let’s all continue to play defense,” reminded Macaraya before the team exited the locker room for the third period. Unfortunately, stopping Happi was easier said than done. The lone bright spot on an otherwise forgettable afternoon for the Generals, the 6’7” Cameroonian split his free throws, hit a difficult turn around jumper on CEU’s Alfred Batiño, and threw up a running hook over Ebondo. The problem was – the Scorpions stayed in step with forward Joseph Sedurifa putting back a missed layup by a teammate and Ebondo stroking a trey; 52-43 for CEU. After another bucket by Happi, CEU’s second foreign player, Aristote Mutombo, raw and gangly unlike Ebondo, found an open Carlo Casiño who had drifted to the elbow. EAC’s Sidney Onwubere ran out to cover but it was too late. Casiño drained it. The two squads answered each other’s bucket as both squads scored 38 points in a 76-67 win for CEU in their Filoil Flying V Hanes Premier Cup debut. The match got a little heated when EAC head coach Gerry Esplana vociferously complained about a pair of non-calls on CEU guard Aaron Jeruta for hooking his way around Tayongtong. It got so heated that Esplana was slapped a technical foul for resentment to a call. By game’s end, Esplana chased the referee but was stopped in his tracks when accosted by event security. The game was a showcase between teams that is currently up there while the other is trying to reclaim lost glory. College basketball is not only growing by leaps and bounds in popularity but in other aspects such as recruiting. NAASCU champions CEU are one of these new wave teams that recruit players from other colleges (even if they only have a year or two left in their eligibility) while also lining up African student-athletes. Then they are exposed to higher competition such as the D-League. Case in point: Carlo Casiño and Alfred Batiño came from Arellano University and the University of Cebu respectively. They have Rodrigue Ebondo who has a good basketball head on him. EAC has been stuck in neutral (or reverse) in the last few years. However in NCAA Season 89, they finished fifth in the league with a 10-8 record; they were on the outside looking in on a Final Four berth. Esplana hopes to bring the Generals back to the glory days of the UCAA and NCRAA when Ronjay Buenafe used to rain baskets with impunity or when Argel Mendoza and the Yaya brothers led this team. Jan Jamon is one of those deadly shooters. John Tayongtong is one of those stocky guards like FEU great Denok Miranda or Arellano Chief Nard Pinto. They’ve also got some good players in Igee King and Jack Arquero. Happi provides a lot of help but if EAC is to go further, he will need his teammates to carry their share of the load. If the dream of making a beachhead into Final Four land that has been the territory of San Beda and Letran in recent years they’ll need to play with a lot more consistency. Inside the CEU locker room, there was elation among the Scorpions. They not only shot better but they also attacked EAC’s weak interior. That netted them 17 free throw attempts and they made good on 14 of them. Their defense was tighter -- 5-1 in steals; 5-1 in blocks, while EAC had 10 more turnovers at 25-15. One of their keys to their game is being reminded to them: REBOUND. That was how RP Youth Under-18 national team head coach Jamike Jarin described in five words the line-up that will be compete Southeast Asian Basketball Association (SEABA) Under-18 championship at Tawau, Sabah, Malaysia from May 5-7. Jarin announced the final line-up of 12 players from a pool of 23 aspirants. Making the team are Henry Asilum (UP), Aaron Black (Ateneo), Andrei Caracut (San Beda), Paul Desiderio (UP), Mark Dyke (NU), Richard Escoto (FEU), Jolo Go (Hope Christian High School), Dawn Ochea (Adamson), Thirdy Ravena (Ateneo), Leonard Santillan (NU), Radge Tongco (San Beda), and Dave Yu (NU). “Of course, the last word (inconsistent) I need to change before the tournament starts,” underscored Jarin who is in his second tour of duty as head coach. The Talk ‘N Text assistant is also calling the shots for the Under-17 team with a different set of players. After his U-18 team lost by a squeaker, 74-73 to Far Eastern University in last Monday’s Filoil Flying V Hanes Premier Cup, Jarin said, “We have a long ways to go.” The nationals had a shot of winning the match but Tongco turned the ball over leading to the match-clinching free throws by Tamaraw guard Joel Lee Yu and a botched shot from the baseline by Jolo Go with three seconds left on the game clock. Joining Jarin on the coaching staff are Jiggs Mendoza, Jing Ruiz, and Ricky Reyes. Other countries participating in the U18 championships include host country Malaysia as well as Indonesia and Singapore. Note: There are four Sacred Heart School-Ateneo de Cebu alums on the team: Asilum, Desiderio, Ochea and Yu. Good job to the guys over there! Outside Rivero, the other newbie who showed some fight in him was Mustre. He committed some errors but you could see the determination on his face to do something positive. You have to appreciate that. Abu Tratter was not his usual self where he would drive hard to the basket (when playing for La Salle’s Team B). I thought he was coasting or maybe even feeling his way around. We’ve seen Julian Sargent play in last pre-season and well, there’s an upside maybe somewhere. It’s just the pre-season but the way these two teams played it was as if it was for the championship. It took two overtimes to decide it in the Red Lions’ favor. Pulsating. Riveting. And as always, intense. If you paid money to watch last Saturday’s opening of the Filoil Flying V Hanes Premier Cup, this match alone was worth the price of admission. I know it’s just the pre-season but nevertheless, here are some thoughts. San Beda’s winning ways no longer surprise me. Even for a team that isn’t bristling with the weaponry it once had, they can still put up the points. What surprised me honestly was Letran. No Raymond Almazan. No Jonathan Belorio. No John Tambeling. And No Franz Dysam. Well, they just keep on ticking. The hustle, energy, and never-say-die spirit continue for this team of – with all due respect here – no names. Maybe Rey Nambatac is the closest to a big name coming out of Letran high school as not much was expected of Mark Cruz who people didn’t think would do well in college. But Cruz is one of those best pound-for-pound players who seemingly can get a shot of against anyone. It’s tough that Letran lost three key players in Nambatac, Cruz, and Kevin Racal to foul trouble but the guys left on the floor were pretty good. Rey Publico had potential last year but this year, yowza! Imagine if he weren’t in foul trouble as well. Jamil Gabawan is one of my favorite college players. He’s one of those classic Letran tough guys who does not flinch, does all the dirty work, and has terrific game. He paired with Belorio last year in doing all of that but it looks like this year, he has another tag team partner in Ian Dela Peña who has a good medium range shot. Ola Adeogun could not push him back at all! That left me shaking my head. He tried several times but couldn’t do so. The other newbies – Daryll Singkontiko and Chester Saldua – aren’t so bad at all. They can shoot and are the active sort. Felix Apreku could be in the mold of George Allen; one of those wondrous under-sized Perpetual Help Altas forwards of several years ago. Could be a defensive stopper with loads of hustle and speed. 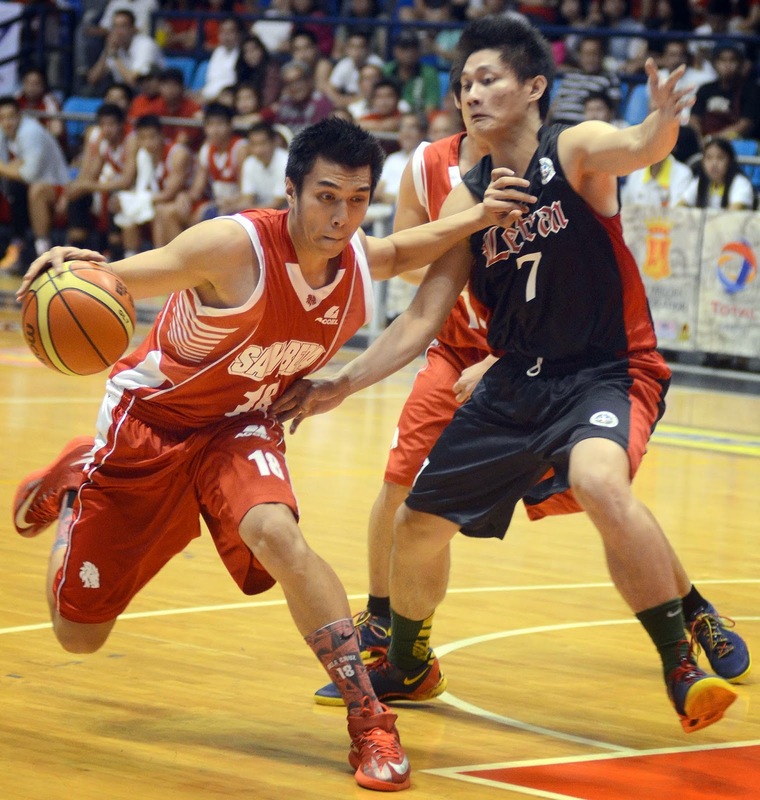 They were too far behind in rebounds – 57-41 to San Beda. So they need to gang rebound. But without that man in the middle to guard the likes of Ola Adeogun they’ll be in foul trouble a lot. Letran has never been one to marshal their fouls because of their physical game. I am not even venturing about changing their style of play. They found a style they are comfortable with and it works for them. But foul trouble is something they do not need especially with their thin front line corps. Furthermore, I am not sure if it’s a good idea to put Rey Nambatac on Baser Amer. Letran needs his offense to complement Mark Cruz. Singkontiko and Saldua will score but we’re not sure if they can be consistent in their play. So Nambatac and Kevin Racal – especially Kevin Racal – need to play better. For San Beda to win it all again, they will need their entire team to chip in. Aside from Amer, the only one who can put points on the board on a regular basis are Art dela Cruz and Adeogun. Francis Abarcar could be that fourth scoring option. This kid can quarterback and can also hit big shots. It is his misfortune that those big minutes are eaten up by Baser. Head coach Boyet Fernandez said that he didn’t play his rookies during crunch time with that game really close. But we can expect others like Radge Tongco and Javee Mocon get more playing time. Mocon can be that guy to replace Rome dela Rosa if the Semerad brothers do not play well. The game of the Semerad brothers seems to have gone down after their first two years. Anthony played well in this match. David needs to pick it up some. Because if the brothers do – I don’t see any NCAA team stopping them. Remember this is just the pre-season. And this is just my take away from that match. Next: my thoughts on the La Salle-UE Filoil match!